The Bourne Supremacy, the second installment in the Bourne film series have a little relevance in terms of story with the book of the same name. The movie however offers even more thrills and especially the chases than its predecessor – The Bourne Identity. If you have liked the first movie, you will definitely like the second movie. The character of Jason Bourne is explored well. And at the end of the movie we got to know the real identity of Jason Bourne. There are cold blooded assassins and plot makers play their part throughout the movie and there are at least 3 car chases which are filmed so well that you will remember it after finish the movie for sure. Such action thrillers usually doesn’t have very long dialogs and writers do not need to prove their linguistic genius. This movie is no exception; the dialogs are simple and small. The writers made sure that the movie doesn’t lose its pace. The cinematography is fantastic. The movie has a chance to explore Goa – India, Moscow – Russia, Naples – Italy and Berlin – Germany. The Indian territory is explored in half-baked way we must say. The people with the turbans shown in the film are usually not found Goa (they are found in Gujarat, Rajasthan and some other areas though). Same we can say for some of the ladies shown in the film (they usually found wearing such stuff in south India mainly). The movie however takes care of other aspects well. Couple of scenes canvased in Naples have dull lighting. In such a nice movie it can draw your attention quite easily. The use of trains also done quite effectively. Matt had to undergo more training for hand to hand combat and the hard work he did is quite clearly visible on screen. His character is quite dependent on his own skills rather than the gadgets and weapons. Though he has the knowledge of the latest technology etc. See how effectively he uses the SIM card copier when captured. The background music is quite good. You can find local music (or the music inspired from the local-folk stuff of the locales) at various places (including some chases) being played. It works as the positive attribute of the film. The movie have a remarkable number of positive attributes which makes it a really good choice for action/thriller lovers. The dubbing is good as well. Matt Damon excels in his role. His body language completely matches his performance. After the movie releases, a lot of version of Bourne series book uses his gestures/frame as the title character; it is his success. Franka (who plays Marie) have a small role as character dies in almost beginning of the movie. She however leaves her impact. And even in the last scene of the movie she is present (in terms of a couple photo available with Jason). Joan is convincing as Pamela Landy but somehow we felt that she is quite thin for the role. She acts well for sure. Brian Cox is the perfect choice for his role. He shows his expression quite well. Karl leaves impact in the role of Krill. Some scenes have emotional quotient as well. For example the scene where Jason tries breathing Merrie underwater OR when he meets Irena Neski, the daughter of Vladimir Neski and tells her the truth about her parents! There is much said about the chases in the film so we are not saying more here but all the chases are thrilling and it is good to watch them on screen. There are several things in the movie which challenge the logic, but we usually accept it as part of entertainment liberty. The end title shows the name of crew from various countries under separate headings, that is good. Actually they are the people who worked behind the scenes to make the movie a nice experience. Let us take a bird’s eye view to the story. It starts in India where Jason lives with Marie. Their house is located near a beach in Goa, India. They live happily though Jason still have some bad memories and still see some bad dreams. He tries note down the stuff and later link it when possible as advised by Marie. However it doesn’t seem the things are coming back to him. And he haunted with his past. He still fears, after so many years, that he at any time will be followed by a group of people he could have been associated with in past. And one day his fears are converted into a reality when an assassin sent from Russia try killing him. During the chase though Marie got killed. Angry Jason decide to finish the matter and he visits Naples. The chain of event take him through various countries and he comes in tough with a number of persons, the good and the bad both. He uses his skills, mind, wit and overcomes the obstacles to track the people who are responsible for Marie’s death and settles account with them. The movie ends with Jason fading in a crowd again to live the anonymous and peaceful life he is waiting for. Will his life be peaceful as he want? 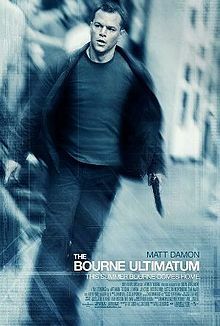 It can be answered in the next movie in the series The Bourne Ultimatum. And yes, the picture and sound quality of the DVD is simply nice. Special to mention is its sound. If you are using even a quality headphone (if not watching on home theater or multiple speakers interface) then also you feel (yes) the surround sound with nature effects. Awesome. Overall the movie works at most of the aspects and it is definitely good choice for thriller lovers.